I decided to get in a couple of good volunteer events before my semester at grad school gets too busy. So before we received the gift of snow and ice, I participated to two volunteer projects in the James River Park this past week and I’m still smiling about it. The dedication and generosity of volunteers has that kind of powerful effect. First, the Friends of James River Park schedules monthly cleanups at one of the 20 parcels of the park system. Winter is a good time to attack North Bank Park because the terrain there has so much overgrowth that hides trash and invasive species, especially English ivy. The worst problem is graffiti, and with the help of more than 50 volunteers on Saturday, the tower over the James River & Kanawha Canal and the CSX railroad tracks is now brown again, Foushee’s Mill is again saved from cowardly graffiti and the Boulevard Bridge is clear of most signs of vandalism. Two years ago I organized a similar volunteer cleanup in North Bank with the FOJRP and I still appreciate the new friends I made that day and the positive effect it had on my appreciation of volunteering. The most impressive part of the crew was the 35 teenagers who volunteered as a part of a church rally. Typically, a large amount of teens don’t make the best volunteers, but this group was focused and dedicated. The church brought teens from North Carolina, New Jersey, Charlottesville and Chesapeake — most of them didn’t know Richmond and especially didn’t know about North Bank or Texas Beach. They worked hard and got things done. 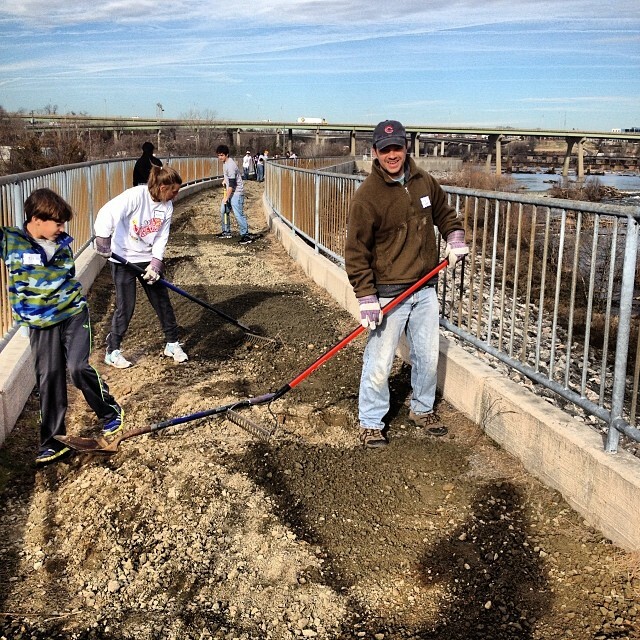 On Monday, in honor of Martin Luther King Jr., the EnRichmond Foundation and HandsOn Greater Richmond provided more than 30 volunteers for trail work at the Floodwall Walk in Manchester. The walkway atop the Floodwall provides a fantastic view of the Richmond skyline and the James River, in addition to being part of a fun trail loop. The gravel crush-and-run surface of the trail had not been replenished in about a decade, but volunteers were able to spread the rock provided by the City of Richmond and thanks to some donated time with the right vehicles to deliver the gravel, half of the trail has been rejuvenated. It was pleasing to hear the thank yous from so many walkers and joggers who passed by while we worked. Of course, I got to bring my kids along and Mitchell and Carly did their tiny share of work and contributed — plus spent a great deal of time outside, which was good considering that we’ve spent way too much time inside the rest of the week because of the snow, ice and cold weather.